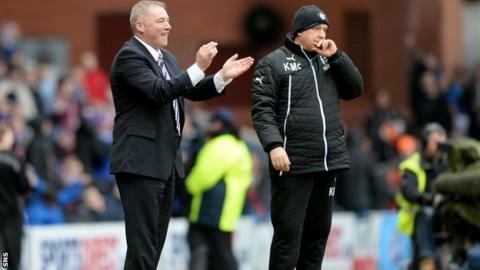 Manager Ally McCoist says Rangers are relishing the prospect of taking on Hibernian and Hearts in the Scottish Championship next season. The Ibrox side won promotion last term, with the Edinburgh clubs relegated from the top flight. All three are expected to battle it out for the two available promotion places. "It gives us an opportunity to pit our wits against two of the country's great clubs and we're looking forward to it," McCoist told the Rangers website. "I've had a chat with the boys about what's expected of us this season and how we see the competition and the games. "There's going to be a lot of focus on this season and there's a real anticipation. I can feel it, not just from the players but from the fans and the staff as well." McCoist has already moved to strengthen his squad with the signings of defender Darren McGregor from St Mirren and experienced strikers Kenny Miller and Kris Boyd. The Ibrox side kick off their Championship campaign at home to Hearts on Saturday, 9 August. There have been major changes at Tynecastle this summer with Craig Levein taking over as director of football and Robbie Neilson being named head coach, following the departure of manager Gary Locke. Hibernian sacked boss Terry Butcher following their relegation, with Alan Stubbs having been named their new head coach. "Hearts and - to an even greater degree - Hibs will have changed squads from last year and the change of management at both clubs will have a massive influence on their playing pools," added McCoist. "The two Edinburgh teams are really big clubs. There's no doubt about that and we've enjoyed going there on numerous occasions. "We've had some great tussles at Ibrox too and I don't see next season being any different. It's bizarre we are all in the second tier but that's where we are at the moment."